Have you ever tried any kind of pasta besides the usual spaghetti and penne? I studied in Florence, Italy, for a few months when I was in college and I left there with a love of pasta I don’t think I could ever give up. When my kids say they want spaghetti sauce I actually cringe, unless I can add things to it. 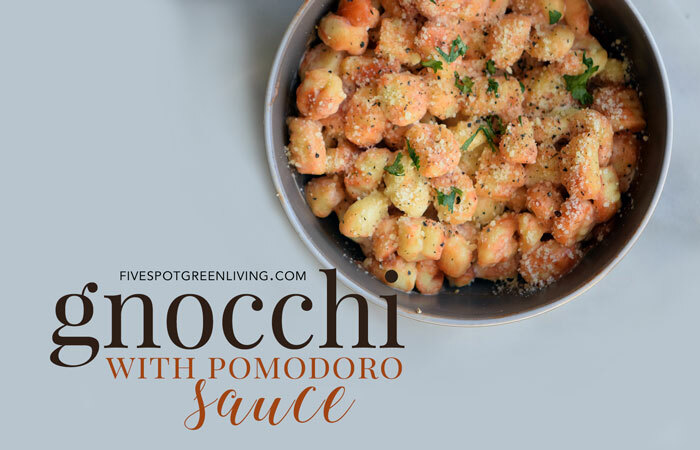 This Gnocchi Recipe with Pomodoro Sauce is hardly “spaghetti sauce” – it’s actually pasta with a homemade tomato-based sauce. This is definitely going on my healthy recipes page! So gnocchi. It’s really a funny little pasta. 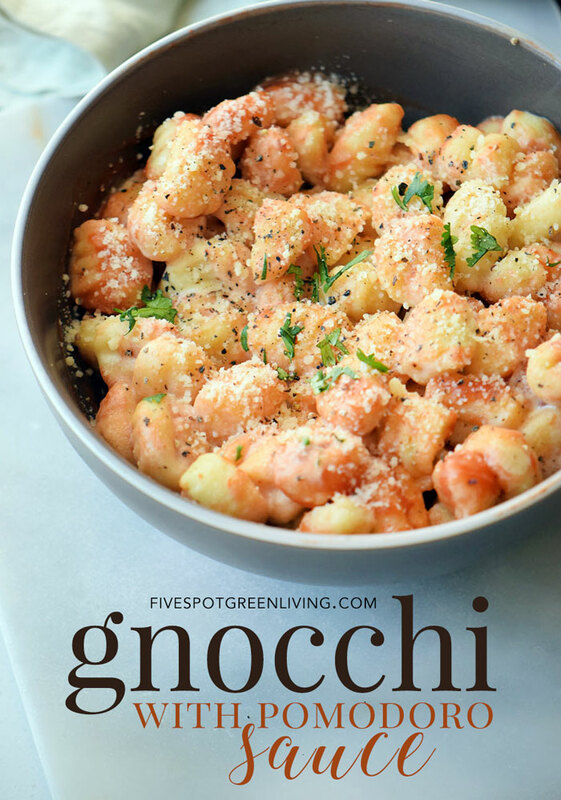 The word gnocchi is thought to come from nocca, which means knuckles, or from the Lombard word knohha, which means knot (such as wood knot) or walnut – all words that imply the small, tight, rounded shape of gnocchi that we know today. 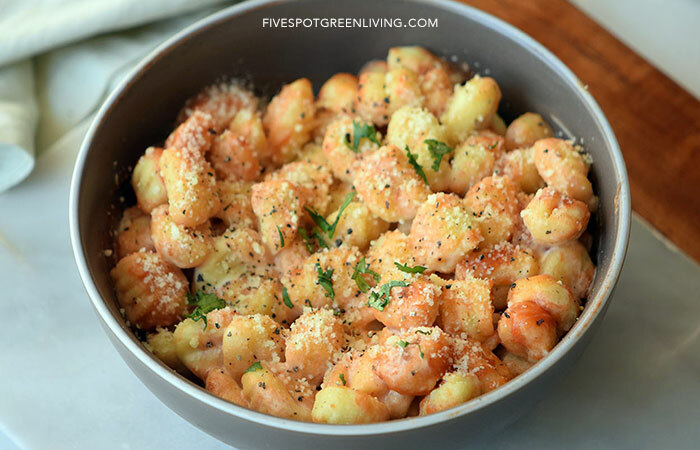 The most famous potato gnocchi that are known and loved world-wide date back to the sixteenth or, more likely, seventeenth century – well after Spanish explorers brought potatoes from South America and introduced them to Italian kitchens. 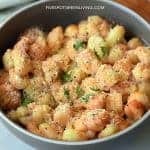 The gnocchi recipe is usually made with semolina or potato (depending on where you are) and the dough rolled out, then cut into small pieces of about the size of a cork. They are then pressed with a fork or a cheese grater to make ridges which hold sauce. In a food processor, combine the onion, tomatoes, garlic, 1 tbsp parsley, and carrot. Pulse until smooth. Transfer to a sauce over medium heat, and add the olive oil, salt, and pepper. In a pot over medium-high heat, boil water, add the bay leaves and place the gnocchi pasta. Cook following the packaging instructions. Drain the water, discard the bay leaves and add the sauce. Mix and then serve in bowls. Top with the parmesan cheese and the remaining parsley. For a spicy kick add some red pepper flakes to the sauce. Try these other Italian style dishes!